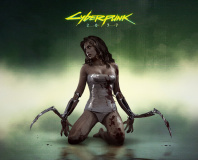 CD Projekt Red, best known for its The Witcher franchise, has warned fans that attackers unknown have made off with internal files relating to upcoming sci-fi role-playing game Cyberpunk 2077 and are threatening to leak them if their demands for payment are not met. First teased by the company back in January 2013, Cyberpunk 2077 is positioned to be even more expansive than best-selling The Witcher 3, thanks in part to additional funding for development of 'living city' procedural generation technology. The company's development process was dealt a blow this week, however, when an attacker or attackers unknown somehow made off with internal files relating to the game and threatened to release them publicly if CD Projekt Red didn't pay up. 'An unidentified individual or individuals have just informed us that they are in possession of a few internal files belonging to CD Projekt Red. Among them are documents connected to early designs for the upcoming game Cyberpunk 2077,' the company explained via its official Twitter account. 'A demand for ransom has been made, saying that should we not comply the files will be released to the general public. Thus far, the documents have not been publicly released.